For the second consecutive year, the ceremonies will be held at the Green Music Center inside Weill Hall. Family members and friends of the graduates also will be watching the ceremonies from the lawn area outside Weill Hall. A video broadcast of all six ceremonies will be streamed live online at commencement.sonoma.edu. “We want everyone to be able to share in this important and memorable event,” said Sakaki. School of Business and Economics – 8 a.m.
School of Science and Technology – 1 p.m.
School of Arts and Humanities – 5 p.m.
School of Social Science A – 8 a.m.
School of Social Science B – 1 p.m.
School of Education – 5 p.m. This year's honorary doctorates are retired Professor of Education H. Andréa Neves and a longtime Northern California advocate for the underserved, George L. Ortiz. Each will be honored during Commencement ceremonies on Sunday. “Both serve as shining examples of the human capacity to elevate others through service,” said Sakaki. Ortiz’s degree will be conferred by CSU Trustee Chair Adam Day at the School of Social Sciences ceremony at 1 p.m., and Neves’ conferral will be at the School of Education ceremony at 5 p.m. that evening. 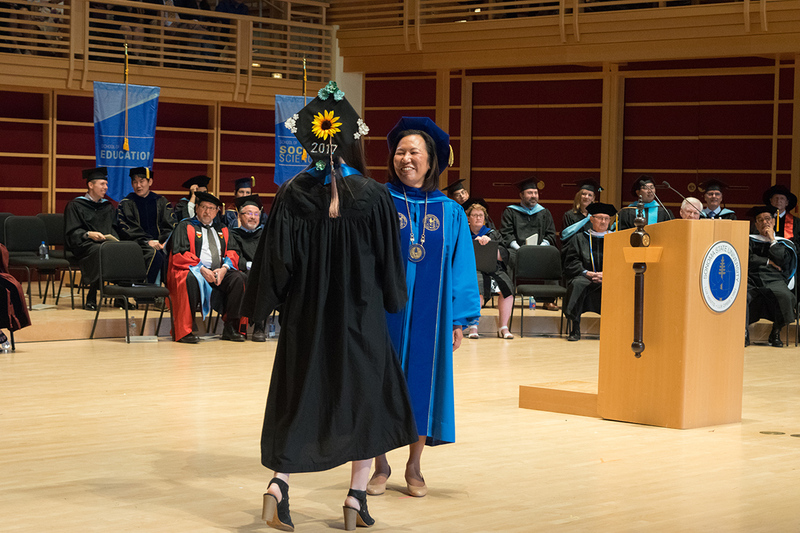 Each of Sonoma State University's five schools selects a student as its banner carrier for the annual commencement ceremony. The banner carriers are students who have made significant contributions to their major department and their school. This year's banner carriers are: Jun Young (Arts and Humanities); Vanessa Aguillard (Business & Economics); Carolyn Samples-Alarie (Education); English Knowles (Science and Technology); Zachary Faerber and Sherri Davenport (Social Sciences). Sonoma State is hosting cultural graduation ceremonies prior to the weekend commencement ceremonies, including Raza Grad, Black Grad, API (Asian Pacific Islander) Grad, and Rainbow Grad (LGBTQ). A reception follows the individual ceremonies, welcoming all cultural graduation participants, friends, allies and families to celebrate this momentous occasion with a dinner buffet and performances from ensembles representing the different cultures in attendance. The official commencement hashtag is #SonomaState. Check out Sonoma State University on Facebook, Twitter (@SSU_1961) and Instagram (@SonomaStateUniversity) for updates and to follow the day's events. For further information, visit the commencement website at http://commencement.sonoma.edu/.